The Visconti van Gogh series is inspired by the paintings of one of the world’s most well-known painters, Vincent van Gogh. This particular pen takes after his Pollard Willows painting, with a unique mix of brown, green, white and yellow tones. Viewed from different angles, the pen’s vibrant colors shimmer as you rotate it and the colors in the natural resin are mixed to represent palettes of oil paint. 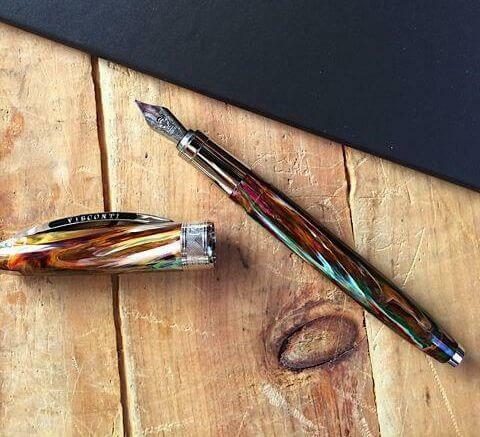 The pen utilizes Visconti’s eighteen-faceted design, with the many edges enhancing its vivid colors. The pen measures approximately 5.5″ (14cm) closed, 6.125″ (16cm) posted, and 4.875″ (12.5cm) uncapped. It has a chromed trim with a sprung pocket clip and a magnetic catch cap. Uncapping and capping the cap feels secure and a pleasure to do so. The pen is well-balanced and is just the right weight for writing. Not surprisingly, the pen is very well-made and bears Visconti’s intricate engravings in the nib and on the pocket clip as well.